The dynamic genome. Up to 95% of human genes undergo a process called alternative splicing. For these genes, several exons are present, which can be used alternatively or can be omitted. Accordingly, a single pre-mRNA can result in a variety of different proteins with different properties. For key players such as voltage-dependent sodium channels, it is therefore interesting to know which role alternative splicing plays in epilepsy. However, the splicing landscape of human sodium channels is complicated and difficult to investigate. Therefore, a model system is required where simple questions can be asked. A recent study now reveals interesting findings related to sodium channel splicing and seizure in the fruit fly. The fruit fly and SCN1A. The fruit fly (Drosophila melanogaster) has only a single sodium-channel gene in contrast to the ten corresponding genes in the mammalian genome. The Drosophila sodium channel DmNav is also named paralytic, referring to the phenotype of a Drosophila mutant that carries a mutation in this gene. In a recent paper in the Journal of Neuroscience, Lin and colleagues investigate alternative splicing in DmNav. Basically, DmNav has two alternative exons that are mutually exclusive. These exons, K and L, have different properties with respect to the sodium current that the authors aimed to analyse. Exons K/L are part of one of the transmembrane regions in DmNav. Drosophila mutants have a very long tradition of being christened with flowery names, which also applies to a second mutant that Lin and colleagues use: slamdance (sda). The sda mutant phenotype is caused by a mutation in a gene coding for an aminopeptidase and is prone to seizures. The mechanisms behind this are unknown. The leaky sodium current. Lin and colleagues made the following observation in one of their earlier studies: there are two types of sodium current in Drosophila neurons. In general, sodium current in neurons are associated with electrical transmission, i.e. activity-dependent depolarisation and action potentials. In response to a stimulus, the membrane is depolarised due to a selective opening of sodium channels. This current is only seen from time to time when the neuron is active. Lin and colleagues refer to this current as the peak current. In addition to the peak current, neuronal membranes are inherently “leaky”. A small sodium current can always measured, but it does not completely depolarise the membrane. The authors refer to this current as the “persistent” sodium current. Leaky currents are also known in mammalian neurons, and some authors have suggested a link to human epilepsy. Interestingly, insertion of exon L (“leaky”) increases the persistent sodium current in Drosophila neurons. Leakiness, splicing and seizures. Lin and colleagues went on to investigate the role of K/L splicing in three experimental conditions. First, they looked at the epilepsy-prone sda mutant. They find that the frequency of channels with the L (“leaky”) exon is increased. Then, they went on to investigate non-mutant fruit flies fed with picrotoxin, a proconvulsant. Again, they found more exon L than in controls. Finally, they treated sda mutants with phenytoin, an antiepileptic drug. The increased rate of L exon insertions went back to normal and the mutant was “rescued”. The increase of L exon insertions was accompanied by hyperexcitability in Drosophila motorneurons, which leads to an increased tendency to seizures in Drosophila. In summary, triggering seizures in Drosophila, either through a proconvulsive drug or through a genetic mutation, results in a sodium channel that is hyperexcitable through alternative splicing. Eventually, this results in a self-perpetuating cycle of hyperexcitability. This leads the authors to conclude that similar mechanisms might be relevant in humans and might explain why “seizures beget seizures”. Alternative splicing in DmNav, the Drosophila sodium channel gene. 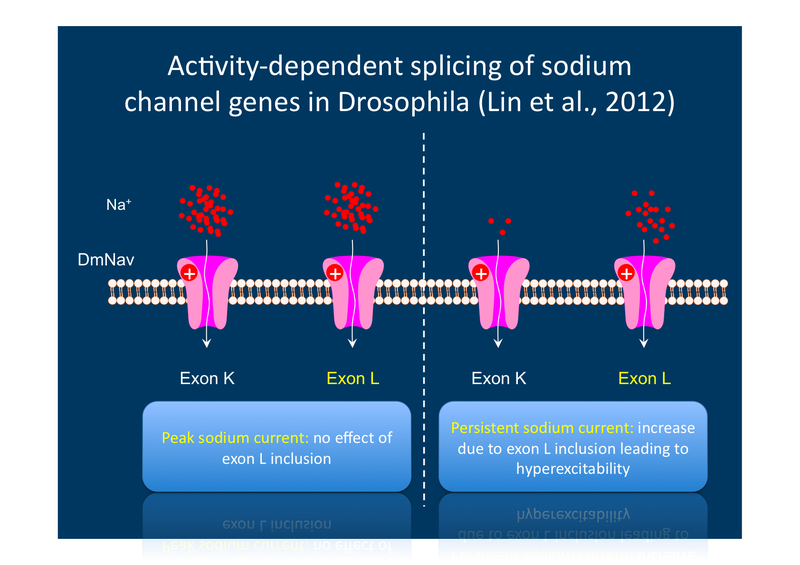 Inclusion of exon L increases the persistent (“leaky”) sodium current, which leads to hyperexcitability. However, alternative splicing with insertion of the L exon occurs in response to increased activity, leading to a self-perpetuating loop. Application to EuroEPINOMICS. By pointing out this mechanism, the authors also provide a way that this self-reinforcing cycle can be broken. In the sda mutants treated with phenytoin, the sodium current and the splicing was normal, suggesting that treatment with an antiepileptic drug can reverse the changes seen in genetically seizure-prone animals. There are various splice site mutations known in epilepsy genes including SCN1A mutations for Dravet Syndrome and various mutations in splice sites are likely to be found in both common and rare genetic epilepsies investigated in EuroEPINOMICS CoGIE and RES. Lin and colleagues provide us with an example how these mutations translate into liability to seizures. This entry was posted in 2012, basic science, Papers and tagged channelopathy, Drosophila, ion channel, mammalian genome, mutant phenotype, SCN1A, sodium channels, splicing. Bookmark the permalink.